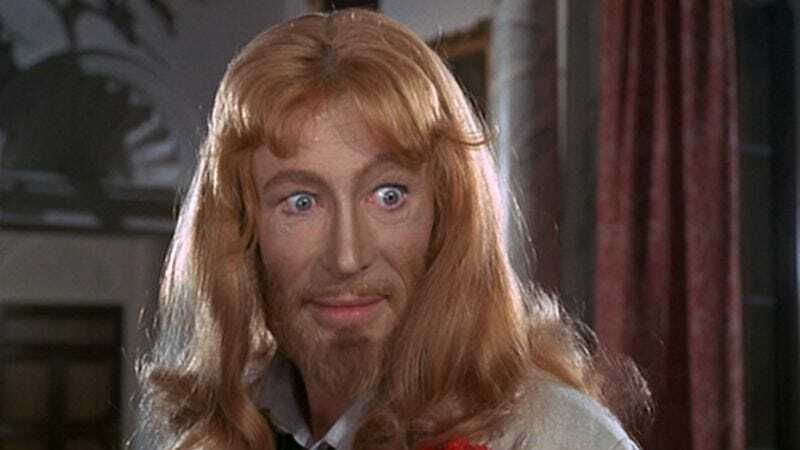 Peter O’Toole thinks he’s Jesus—and why wouldn’t he? Smartly adapted for the screen by Peter Barnes from his own play, The Ruling Class was released in 1972 to no small amount of controversy—it was cut for release in the United States and banned outright in South Africa. It endures beyond its rocky reception as one of the great modern aristocratic satires, slyly implying that the manor-born are subject to a different set of rules than the rest of society. At the same time, it evokes empathy for its protagonist’s peculiar plight, which has an awful lot to do with the casting of Peter O’Toole. A decade out from his iconic turn in Lawrence Of Arabia and seemingly eager to cut loose, O’Toole appears here as a lithe, limber force. Jack’s verbal agility and joyful comportment make him attractive despite his eccentricity, and instantly preferable to his stick-in-the-mud family members, who resent his virility and covet his title. The status of Earl is Jack’s birthright, as is his insanity, which, far from distorting his personality, merely exalts something latent. Is it really so absurd for a beautiful, blue-eyed, blond-haired rich kid with people hanging on his every word to see himself as the risen Christ? The gap between Jack’s glorious self-perceptions and the pity and contempt of the people around him provides roomy comic space for O’Toole and a crack cast of British actors to move around in, but The Ruling Class is more than a sophisticated upper-crust farce. Its depictions of psychotherapy as a discipline compromised by personal prejudice (Jack’s doctor is about to commit him before learning that they went to the same boarding school) and conflation of madness with capitalism (in a final speech that may be O’Toole’s greatest piece of acting) mark it as a film with a chip on its shoulder, while a late turn into horror-movie territory merely clarifies the grimness of writer Peter Barnes’ worldview. This is a uniquely lucid movie about the nature of delusion, and in the end it suggests that Jack’s mania is a byproduct of his manicured upbringing—and that the insanity isn’t about to stop any time soon. Availability: The Ruling Class is available on DVD, which can be obtained from Netflix and your local video store/library.